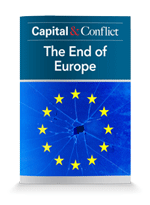 To download your free report, you simply need to sign up for our free daily email Capital & Conflict. If you’re worried about threats to your wealth… want to see what’s really happening in the financial system… and get solid ideas about how to protect your money… sign up to Capital & Conflict now. The moment you do, we’ll rush over your urgent investment report… revealing why a blow-up in the European financial system could damage your core investments this year. Most importantly you’ll get actionable ideas to show you what you can do to survive this coming market shock. Registered in England and Wales No 9539630. VAT No GB629 7287 94. Registered Office: 2nd Floor, Crowne House, 56-58 Southwark Street, London, SE1 1UN..